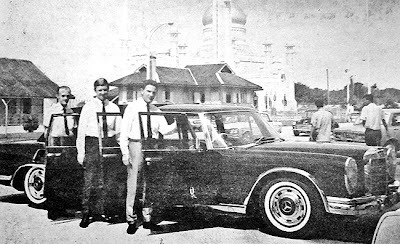 JULY 20, 1968 - This sleek black car, the first and only six-door Mercedes-Benz 600 Landaulet built, arrived in Brunei Town earlier this week for delivery to the Sultan. Standing by its open doors are (from left) Mr Leon Gyselman, Manager of Borneo Traders, which is the Brunei agent for Mercedes cars, Mr J C Gorgels, the Daimler-Benz factory representative in Singapore and Mr Hans Hoffmann of Daimler-Benz’s export service. Mr Gorgels and Mr Hoffmann came to Brunei with the Malaysian agent’s central service manager and an assistant to carry out the final preparation of the car before delivery. Mr Gorgels said the Sultan’s car is the only six-door Mercedes 600 that has been made with a landau top, which folds back. The car was hand-made. The 21-foot-long car weights 2.8 tonnes. It is powered by a 300-horsepower V8 fuel-injection petrol engine.